Tryp Review: Ridesharing pyramid scheme with illegal stock options? Tryp provides no information on their website about who owns or runs the business. The Tryp website domain (“tryprides.com”) was registered on July 12th, 2018. The domain is owned by Robert McNulty, through a virtual office address in the US state of Nevada. Further research reveals Tryp marketing material and affiliates citing McNulty as CEO of the company. Why this information is not provided on the Tryp website is unclear. 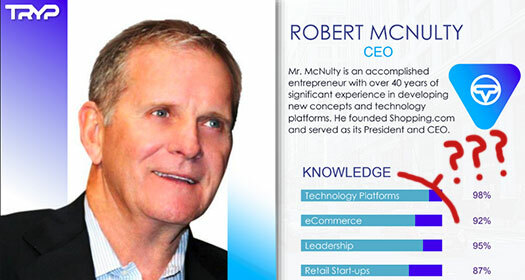 McNulty has a history in e-commerce, most notably as founder, President and CEO of Shopping.com. What you won’t find in Tryp marketing material however is McNulty’s tenure as Shopping.com CEO was marred by a market manipulation investigation by the SEC. Later that year McNulty resigned, although he was hired back two weeks later as a “consultant” (nothing suss). Shopping.com was sold off to Compaq a year later in 1999. One thing I’ll note is the Wikipedia page for “shopping.com”, which states the site was ‘founded in Israel in 1998 by Dr. Nahum Sharfman and Amir Ashkenazi‘. Robert McNulty’s name does not appear in the entry, so I’m not sure what’s going on there. McNulty founded Shopping.com back in 1996, stepped down by 1998. Shopping.com eventually was sold off to Compaq who owned AltaVista at the time. Elsewhere in Israel, Sharfman and Ashkenanzi founded Papricom, dba DealTime.com in 1998. They bought the shopping.com domain in 2003 from Alta Vista and rebranded itself shopping.com and was eventually bought by eBay in 2005. Five years prior to “founding” Shopping.com, McNulty was investigated by the SEC for, among other things, anti-fraud and securities law violations. In a complaint filed by the Commission on September 30, 1994, McNulty was charged with orchestrating a complex scheme to defraud investors by using the proceeds of securities offerings by HQOS, HQOI, Auto Giant and Auto Depot to finance the operations of affiliated companies and the companies’ underwriter and market maker, Global America, Inc., rather than for the stated purpose of funding the issuers’ operations. McNulty settled the charges in October 1995. In late 2009 McNulty launched, Kaching Kaching, an e-commerce niche MLM company. As of late 2010 the company was still operational but appears to have shut down sometime thereafter. At the time of publication the Ibuyrite website has an Alexa traffic ranking of 11.3 million, which is as good as dead. In early 2018 McNulty co-founded SupplyBloc, in which he also held the position of CEO. SupplyBloc initially planned to sell its SUPX ICO for $1 a coin. In May 2018 SupplyBloc “temporarily paused” its pre-ICO, amid concerns the company might potentially be committing securities fraud. As of January 2019 SUPX has failed to materialize. Read on for a full review of the Tryp MLM opportunity. Tryp as an MLM company has no retailable products or services, with affiliates only able to market Tryp affiliate membership itself. There is mention of a ridesharing app on the Tryp website, which as I understand it doesn’t exist yet. If you click any of the app download links on the Tryp website, you’re redirected to a “coming soon” page. Furthermore, as detailed in the compensation plan breakdown below, the ridesharing component of Tryp has nothing to do with their MLM opportunity. The Tryp compensation plan combines ridesharing fees with recruitment. Although Tryp’s ridesharing app doesn’t exist yet, I’m including rideshare commissions as technically they are part of Tryp’s compensation plan. Note however that Tryp’s ridesharing commissions are not MLM-based (affiliate drivers receive commissions directly from app users). In their compensation plan material Tryp don’t disclose specific commissions earned on rideshare fees. An example in the Tryp compensation plan cites an average 40 cent commission per ride taken through the app. No basis for this average is provided. Note that Tryp affiliates only earn rideshare commissions on app users they personally refer. Tryp affiliates sign up and pay a monthly fee. Commissions are paid when they recruit others who do the same. For each affiliate recruited, a Tryp affiliate receives a $50 commission. Trip pays residual commissions based on direct and indirect recruitment activity. It is unclear whether a Tryp affiliate needs to maintain three personally recruited affiliates to qualify for residual commissions. With respect to “downline”, Tryp tracks an affiliate’s downline via a unilevel compensation structure. As per the diagram above, personally recruited affiliates are placed on the first level of the downline. Each personally recruited affiliates starts a new unilevel team leg. Any affiliates level 1 affiliates recruit are placed on level 2 of the downline and so on and so forth. Note that no more than 40% of required downline affiliates at any residual commission rank can be counted from any one unilevel leg. Tryp affiliate membership is $250 plus $199 a month. In order to earn commissions beyond the Pro rank, payment of a $149 annual “influencer” fee is also required. There are some major red flags with Tryp as an MLM company. First and foremost there’s no mention of the MLM opportunity on Tryp’s website. Rather, the website is basically marketing for Tryp’s rideshare app – which is fine… except for the fact that it doesn’t seem to exist yet. A legitimate MLM company does not hide their MLM business. Failing to provide basic executive information on the Tryp website is also a red flag. As to Tryp’s MLM opportunity, it’s a straight-up pyramid scheme. The MLM component of Tryp’s compensation plan is 100% tied to recruitment. Tryp refers to its affiliates as “drivers”, whether they drive or not. Tryp’s affiliate drivers pay $250 and then $199 a month. 100% of commissions paid out through Tryp’s compensation plan are tied to recruitment of affiliate drivers. This is as basic an MLM pyramid scheme as you can get. I also want to emphasize that should Tryp’s rideshare app materialize, that it in no way legitimizes 100% of Tryp’s MLM commissions being tied to affiliate recruitment. From a regulatory standpoint nothing justifies pyramid recruitment. require them to be paying out more in rideshare fees as commissions versus affiliate membership fee commissions. As it stands Tryp began soliciting affiliate fees on or around mid December – yes, that’s without the public release of their ridesharing app. So you’ve got an MLM company leading on their website with a product that as of yet doesn’t exist, whilst quietly only accepting pyramid scheme membership fee payments on the backend. I searched high and low for specifics of Tryp’s Founders Club but turned up nothing. This leads me to believe those who signed up might have been sworn to secrecy (NDA). Regardless, as per the official Tryp marketing material to the right, Tryp Founders Club affiliates are/were invited to ‘take advantage of a very special and lucrative stock option bonus program‘. That there’s no public record of this option should be ominous enough. What I can tell you is that neither Tryp or Robert McNulty are registered with the SEC. Meaning any stock options offered to Founders Club affiliates, whether implied, promised or actual, have been done so in violation of US securities law. To summarize Tryp’s MLM opportunity; we’ve got a rideshare app being marketed that doesn’t even exist yet, pyramid recruitment and potential securities fraud. Great job reviewing this. I new it was a BS company that was being peddled by my stupid coworker, but couldn’t get all the nuts & bolts from the sketchy info he was providing as selling points. Especially, all the history of McNulty that you have discovered! Thanks again for another stellar review, exposing the fraudsters! I think we have a bit of a mix-up between two separate entities that were merged later. FWIW, McNulty is also linked to KachingKaching, LocalAdlinks, and possibly a few other things. There’s a blog from 9 years back called mcnultyscams.blogspot.com that I hadn’t had a chance to factcheck. Therideshareguy.com has nothing good to say about Tryp. Ah that makes a bit of sense. So basically McNulty’s shopping.com was sold off to Compaq/Altavista for $220 million. The Israeli guys then bought it and improved it, to the tune of $634 when it was later again sold to eBay. The company, which has never turned a profit, went public at $9 a share and saw its stock surge to $31.13 earlier this month. Outside of the dotcom boom sale, which I suspect was in large part acquisition of the domain name, McNulty’s shopping.com was a commercial failure. Shush. Let me get the shooo money first. Of course it’s a pump and dump the domain for sale game attached to a huge buyers list for all kinds of auto services. So……I would like to first point out that the Author of this article uses Wikipedia as a reference site. Since there is not one institution of higher learning or Academia will use that information as a RELIABLE source, the credibility has already gone out the window. Second, the information he has provided is well out dated. They have a great deal of information about the stock options out there. Third, the information provided about alleged fraud has not been justified by the SEC investigation. McNulty, did in fact, cooperate with the SEC and all allegations could not be proven. As far as the blogspot goes, I have fact checked his allegations and his dates and information are all incorrect. He clearly did not do his due diligence in regards to the information. I can also assume he probably has a personal connection with McNulty. His blog spot suddenly appeared in regards to McNulty with no previous mention of him before hand. He clearly had a personal agenda. However, if you even do a google search for Mr. McNulty you will see that there is very little in regards to criminal activity. As far as having association with multiple failed businesses. Well, I can show you that there have been many very successful people that have the same kind of history. I personally think it is funny that multiple individuals are using this source and the blogspot article as fact to argue the validity of Tryp and its opportunities. Oh and K. Chang, therideshareguy is an early “influencer” for both Uber and Lyft. HE even says that he and his “team” make videos on ride share. You realize he is making money off of you every time you watch his channel. He is nothing more than a ride share driver who has found a way to up his hustle to make money off of you. He is only creating videos to negate Tryp in an effort to keep you watching their channel, making money off of your time. Everything that Tryp has claimed was going to happen, has in fact happened. YES I have the ability to provide proof. However, once I provide it, it will only cause more push back. Been there and done that! What is a joke is that one day, when all this becomes a valid company and the app is there and people are using it. You all will want to then jump on the bandwagon, as if none of these comments were made. You all are a joke! Wikipedia isn’t a source in and of itself. Sources used by Wikipedia are always footnoted. Oops, being a disingenuous fuckwit. There goes your credibility. Oh so it’s all out in the open now is it? Funny how it was all hush hush until this review was published. Third, the information provided about alleged fraud has not been justified by the SEC investigation. What investigation would that be? I wasn’t aware of an SEC investigation into Tryp. McNulty, did in fact, cooperate with the SEC and all allegations could not be proven. Nope. McNulty settled. He chose not to defend the charges, which speaks volumes. And that proves what exactly? The fact remains McNulty has had run-ins with the SEC related to alleged fraud. Again, McNulty didn’t defend himself. Everything that Tryp has claimed was going to happen, has in fact happened. Except y’know, the rideshare app. Next to your endless excuses, that’s the biggest joke of all. Drivers are at the heart and soul of Tryp. We are committed to providing the highest pay and also a stock option incentive plan for every driver as the company grows in size. A “great deal of information” indeed. Funny how those lying through their teeth are always first to run around accusing everyone of doing the same. Oh and Tryp still isn’t registered with the SEC, so any offered stock option is still totally illegal. You can “ASSUME” all you like, it doesn’t make regurgitated marketing spam or your conclusions any more believable or factual. MLM’s are not Pyramid Schemes. An MLM company without significant retail sales is a pyramid scheme. I suggest you go and do some research before mouthing off. I removed the rest of your derail waffle as it had nothing to do with Tryp. The schemers are having a 3 o’clock meeting in Miami today to release the phantom app. The problem is that all these drivers that they signed up that are paying monthly subscriptions haven’t driven one ride share ride to the public. Basically it’s a massive Ponzi scheme with no actual product being delivered and people being paid commissions to sign drivers up who never actually drive any rides.